REX-USB60MB is a USB to serial converter. 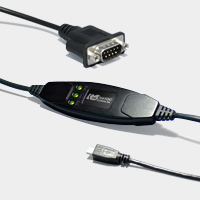 Compatible with Universal Serial Bus specification Rev. 1.1. Micro USB (B type Male) connector. Easy to connect Android tablet and smart phone. Equipped with the Micro USB B type Male connector that can be connected directly to the USB port of smart phone. Power supply for USB60MB use the bus power from the USB port. If the power from USB bus is properly supplied 5V, PWR LED will be on. Easy to detect for the data flow. The terminal application "USB60Term" published at Google Play.